FLASHBACK – Just Say “Hi” and Then “Fly”… to New York! Flashback to Spring 2017, part of the most amazing year of my life! My story of that day…which which started with “just saying Hi,”…which led to New York City…which led to That Event…which led to celebrities…which led to 5th Avenue…which led to…this story! Lesson #2. If you see just a tiny window of opportunity, GO FOR IT! Do not doubt yourself!!! 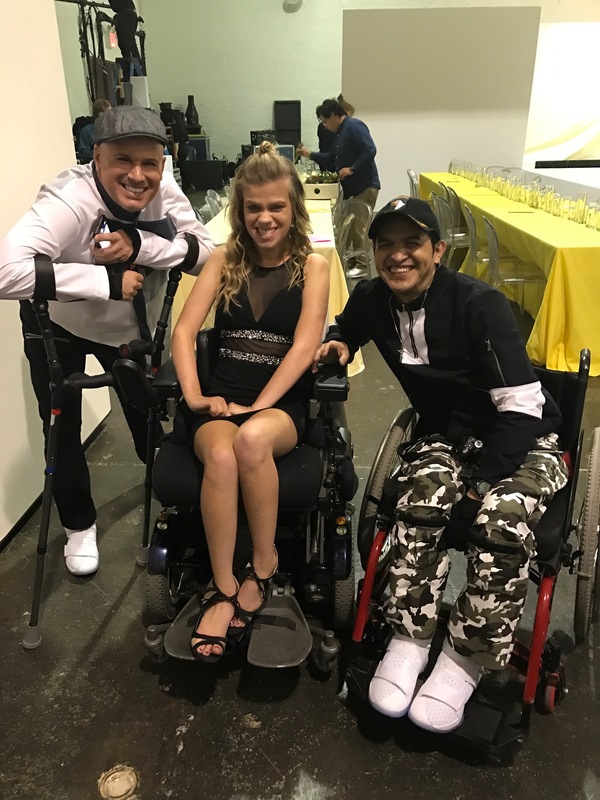 That simple greeting launched our conversation into the Emmy-nominated show, “Speechless,” and the CP Foundation campaign, and especially to my interest in the world of adaptive fashion design. I couldn’t believe she was taking all this time with me! Finally, Barbara asked her assistant to give me one of her mysterious “Barbara” cards with her personal number, and a promise for us to keep in touch with one another. Driving away, stunned… I didn’t know what just happened… but I did believe a door of opportunity had just cracked open. Fast-forward three weeks; college was out for summer; I was having a mundane day… until I opened my emails and saw IT! I screamed as my mom raced to my room to find I had not fallen off my bed, but rather, had received an invitation from Barbara inviting my parents and me as her special guests to the “Design for Disability Gala” in New York City in two weeks!! Everything we had spoken of that afternoon in Gainesville had led her to think of us for this thrilling invitation. The gala is a unique event where a famous fashion designer (in this case Derrick Lam) mentors six design students from respected design schools on how to adapt their clothing collections for those with disabilities; it was also a benefit for the Cerebral Palsy Foundation; AND, so exciting – the cast of TV’s hottest new show “Speechless” would be there!. Mom, Dad, the answer just has to be YES! We can’t say “NO” to the founder of Vera Bradley! And so, within 14 days, we were catching a Yellow Cab to meet Barbara again, this time in a trendy converted warehouse located in New York’s historic garment district! Prior to the industrial revolution until the mid 20th century, the garment district was the hub for all things couture’ and designer in America. Now, the majority of those warehouses have been converted into rustic yet charming venues for special events. The 2nd annual Design for Disability gala highlighted student work from The Pratt Institute, Fashion Institute of Technology, and Parsons School of Design with collections of design for individuals with a variety of body types, all of whom need clothing that is easy to get in to and out of. The purpose of this project is to challenge aspiring designers to think outside the stereotypical mindset of designing for typical body types. Before the fashion show, a glamorous cocktail hour filled with celebrities, the media, and fashion lovers would set the mood for the night. The walls were decorated with huge paper flower gardens and powerful quotes from the models, blown up along the walls. Photographers and press surrounded Loreen Arbus,the major event benefactor and daughter of NBC’s founder, as well as Scott Silveri, the creator of Speechless (and a writer for Friends), and the cast, including Minnie Driver and Micah Fowler, who himself has CP. Barbara would graciously introduce us to her family and her foundation’s board members, and then join them at Vera Bradley’s runway-facing table as a major sponsor. 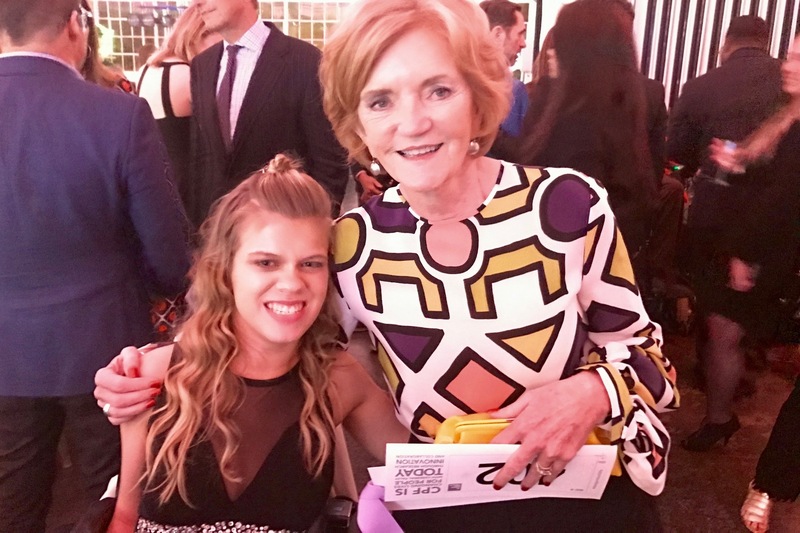 I myself was seated next to Barbara’s granddaughter and her best friend, who is Tory Burch’s neice!As we mingled through the crowd, I spotted my friend and mentor Mindy Scheier, founder of Runway of Dreams, and her assistant Debbie, whom had invited me to New York the summer before at the inaugeral Runway of Dreams runway show for adaptive fashion. She was amazed to see me, and the three of us took photographs together! I was barely breathing, with me and Mindy and Barbara – two of my mentors breathing the same air in New York City! In just a couple of weeks I would be back to model in Mindy’s signature event with designers from Tommy Hilfiger, who had been busily designing an outfit based on my body type! I also, literally ran into the famous comedian Zach Anner and makeup YouTuber, Maysoon Zayid, both of whom are committed to de-sensitizing the public about Cerebral Palsy. The world does not have to tip toe around disability stigmas, we have tougher skin than people think. 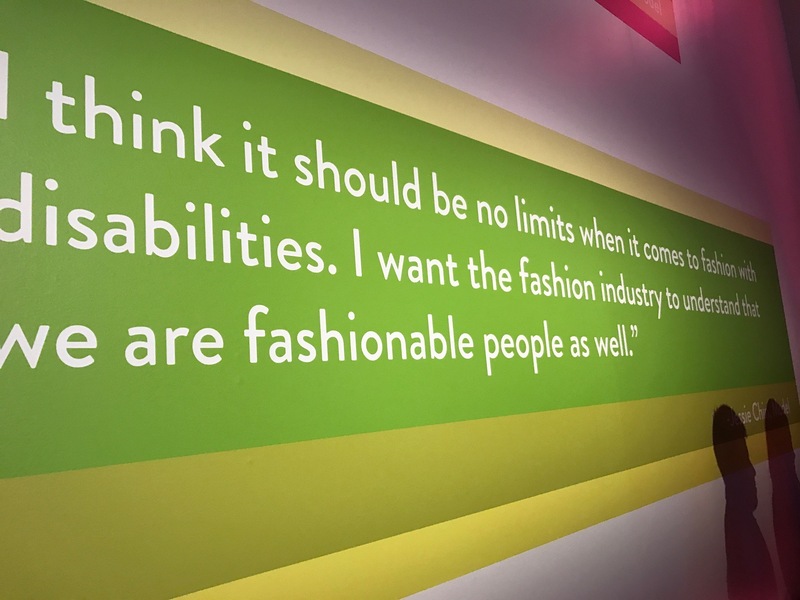 Lesson #5: Disability has begun to find its voice in fashion. At the stroke of 7:30, everyone glided upstairs where the main event was awaiting us. There, running the length of long tables surrounding the runway and the entire room, were hundreds of Spring-fresh tulips in a rainbow of colors. Just beautiful! Since the Vera Bradley foundation was a major sponsor of the Cerebral Palsy foundation, we had a front row seat to the show! The atmosphere might have been the opposite of what you think with some of New York’s elite philanthropists. The room bubbled over with nothing other than humility and generosity. There’s still goodness in the world if you see past the masks and the distractions. And, they don’t lie when they say; “The Gator Nation is everywhere!” We sat across the table from the global VP of visual merchandising for Vera who is UF alum! We chatted about strategic placement of merchandise and seasonal themes. After a delicious dinner that I could barely eat, the runway show began! 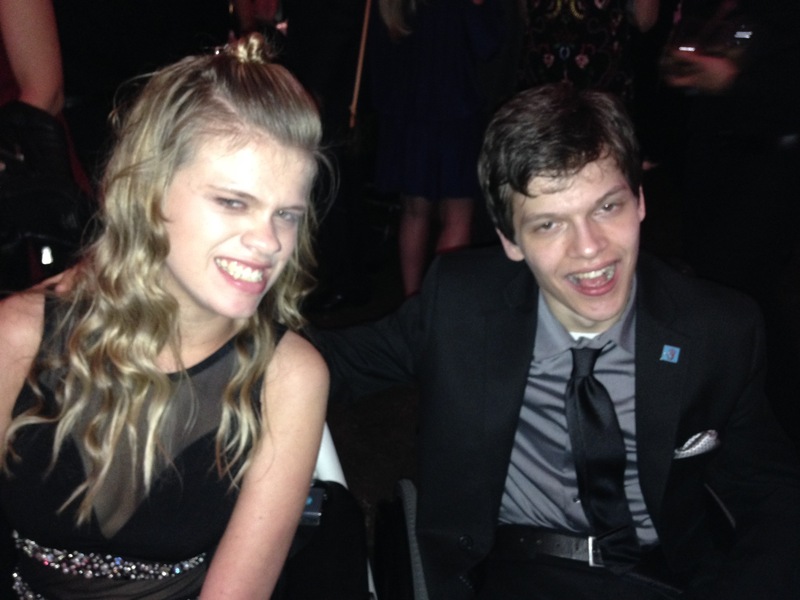 But first, Micah Fowler, star of Speechless, and his TV Mom Monnie Driver,gave an emotional if stuttered speech on the importance of CP research. My instinct wished someone would help him speak, but I fully understood what it meant to have your own voice. I got a taste of my own words! It was eye opening, or should I say “ear opening” to be on the other end of listening to someone who has speech difficulties. Next, Toby Hatfield, lead designer from Nike, was honored for his work on the Nike Fly-Ease sneaker that is fully adaptable, opening from the back with velcro! Finally, Derek Lam kicked off the show with his protegees’. There were no dry eyes in the house, as the models walked and rolled down the runway to a standing ovation that lasted the entire show! The male and female models had just the right amount of attitude and flare with their beautiful outfits that the designers complimented to their individual body type. For instance, a young woman with crutches worked a kerchief skirt that flowed beautifully with her unique gate. And one of the guys is a photographer, so his pants had velco storage around the knees so he could get to this supplies. After the show, I personally spoke with a designer who focused on paraplegic and sensitive skin. He and his model explained how crucial it is to have breathable fabric due to his client’s inability to regulate core body temperature. Furthermore, eliminating extra seams on the back of pants allows more comfort for those who are seated most of the time. I felt so blessed to have this was a once in a lifetime opportunity to be immersed in an event like this and just wished there was more time to soak everything up! It was time, now, to navigate my way through the sea of people to say “hi” to the Speechless crew. My dad pulled the creator of the show, Scott Silveri, aside and asked if he wanted to meet the real life “DeMayo” family. He came over and chatted for a bit, but the real excitement was when he asked if I ever make it out to LA? Let me just try!!! He followed by a invitation to the set if I was in the area! I tried to play it like it wasn’t a big deal. Who knows… Only time will tell! The night came to a end and I was on a high, thinking nothing could possibly get any better but I was wrong! Lesson 6: Always be grateful for what you have been given and never take experiences for granted. For that, you will receive more than you’ll ever imagined. 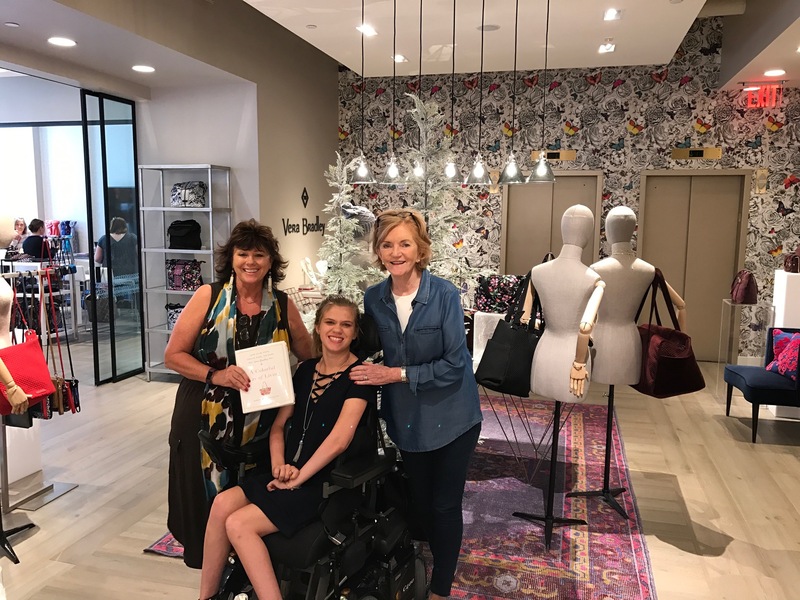 As we said our gratitude and goodbyes to Barbara, she extended an invitation to brunch the next day at Vera Bradley’s corporate headquarters on 5th Avenue! I could barely sleep after all the festivities! Next day, we checked out of the beatufiul Quin hotel near Central Park, hopped in an accessible cab and made our way to 5th Avenue, famous for all the major fashion corporate offices… Calvin Klein, Coach, ect. I couldn’t believe my eyes when I saw Vera Bradley’s showroom neighbor was none other than Tommy Hilfiger! (whose offices were being protested with a big unflatable RAT, for higher wage increases we learned.) I don’t believe in plain coincidences without a particular reason! I was meant to be here! The elevator doors opened to an extravagant show room with chandeliers, decorative wallpaper and gorgeous Vera Bradley merchandise everywhere on glass tables…a fantasy land! Barbara awaited us with open arms ready to give us a tour of next season’s collection. ~ People in hiring roles are always observing your actions. You can learn more about someone from how they treat others than how they treat you. As I look back at this experience and the graciousness Barbara expressed to me, I am humbled and will carry them with me wherever I go. I, too, will just say Hi! to those I meet, and then really listen to what comes next. What does being “Fearless” mean? but I wish to say that this write-up very compelled me to check out and do so!